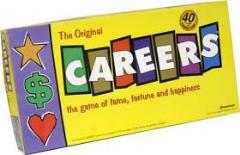 Careers is a game where the players set their own victory conditions. A player may choose to pursue Fame, Happiness, Money, or a combination of all three. The limitation being that the total number of "points" earned in the 3 categories must total 60. eg. 60 Happiness, 0 Fame, 0 Money; 20 of each; or any other combination. The players endeavor to fulfill their goal by going through any number of different "occupation paths". All paths have some prerequisite for entry, and benefits accrue from going through any of the paths more than once. The different occupations are designed to be suited to different strategies, eg. Hollywood is good for fame points, while "Going to Sea" is good for happiness. In the end it is the player (or team of players) who gets to their pre-set goal first who will be the winner, and achieve everything they ever wanted in life.